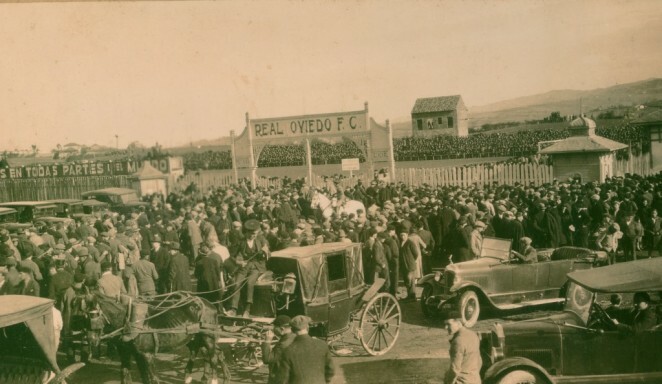 The first friendly matches disputed by Oviedo Football Club took place at Campo de Vetusta, where Real Stadium had played prior to the merger. This was because the pitch at Teatinos was still being prepared, with grass being sown. 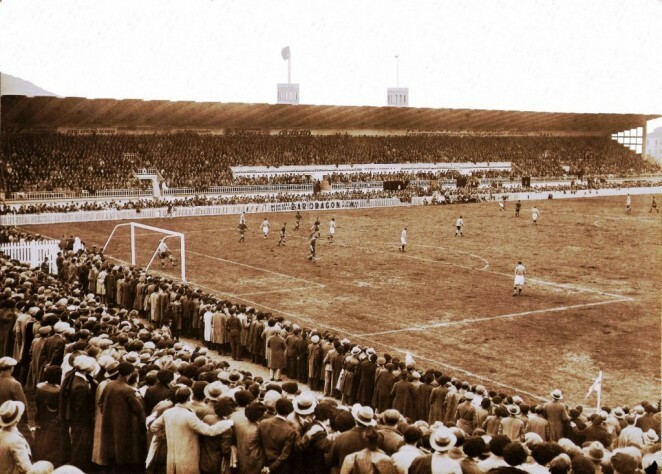 On the 19th and 20th September 1926, in the middle of the city’s San Mateo celebrations, the improved Campo de Teatinos saw the first international match disputed by Real Oviedo Football Club. A fine turnout by the fans saw the club raise 8,414 pesetas. The match finished with a victory for Oviedo, beating Athlétic de Viena 3-1, with goals from Trucha (2) and Barril. The huge growth enjoyed by the newly formed club eventually led to a need to build a new home. The new stadium was named Buenavista, and located in the higher area of the city (Ciudad Jardín). It was inaugurated on 24th April 1932, with an international match between Spain and Yugoslavia (2-1). The roof of the main stand built by Sánchez del Río made this a stadium ahead of its time. It was a 100 metres long covered stand, and was the first stand in Europe to not have pillars supporting the roof. The owners were the shareholders of the Sociedad Anónima Stadium. Following the Spanish Civil War, the Estadio de Buenavista lay in ruin, and the entity had to apply for a loan from the Committee for Devastated Regions. On 15th September 1941, the club received communication of the transfer of 250,000 pesetas, with the aim of restoring the splendour of the stand, playing field, scoreboard tower and toilets. 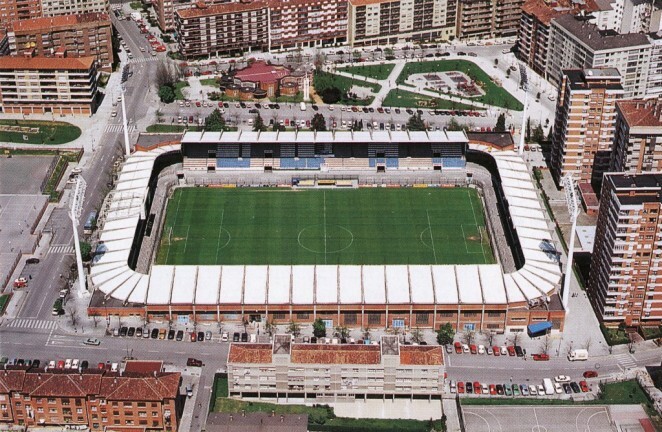 On 16th July 1952, the so-called High Guild Committee was created with the intention of purchasing the shares held by Sociedad Anónima Stadium, so that the future owner of the stadium would be Oviedo’s City Council. On 24th August 1954, the sale of Buenavista to the city council was completed in the presence of the public notary Pedro Caicoya De Rato, using protocol 972. The club became the tenant of the stadium for an annual fee of 30,000 pesetas. The final sale price was 842,901.97 pesetas, with 600,000 paid at the time of the sale. On 17th June 1958, Real Oviedo’s Board of Directors communicated their desire to rename the stadium as the ‘Stadium Municipal Carlos Tartiere’ to the Mayor of the city, Valentín Masip Acevedo. This request was granted on 22nd July 1958. Real Oviedo Club President, Enrique Rubio Sañudo, inaugurated the first floodlights in the Estadio Carlos Tartiere in a friendly match against Real Madrid (0-2) on 4th June 1969. The amazing moment took place in the 33rd minute of the first half, at 21:01 and 40 seconds. The match was halted temporarily so that Enrique Rubio Sañudo, López Valdivieso and Mateu de Ros could press the switches to light up the stadium. On 21st December 1970, Hermanos Díaz Carbajal and CEYD were detailed to cover the former main stand, in a period of 72 days. In the now-covered main stand, two floodlight towers sustained illumination, while in the Tribuna Principal it was found along the 100-metre long stand. REOPENED IN 1982. CAPACITY 23.500. The Buenavista Stadium was completely remodelled for the World Cup held in Spain in 1982. It was newly inaugurated on 29th April 1982, with a friendly between Real Oviedo and Chile’s national team (0-0). In 1991, the stadium played host to the club’s debut in European competition. The UEFA Cup tie between Real Oviedo and Genoa (Italy) saw the home side triumph 1-0. In 1998, new security regulations introduced in sports venues forced many standing areas to be reduced. The stadium capacity fell to 16,485 (13,605 seated and 2,880 standing). In a manner reminiscent of the early years of the club, there was once again a need to find a new home for the club. The stadium’s demolition began on 27th January 2003 and it was completed in two months. The Oviedo City Palace of Expositions and Congresses now occupy the site of the club’s former home. OPENED IN 2000. CAPACITY 30.500. 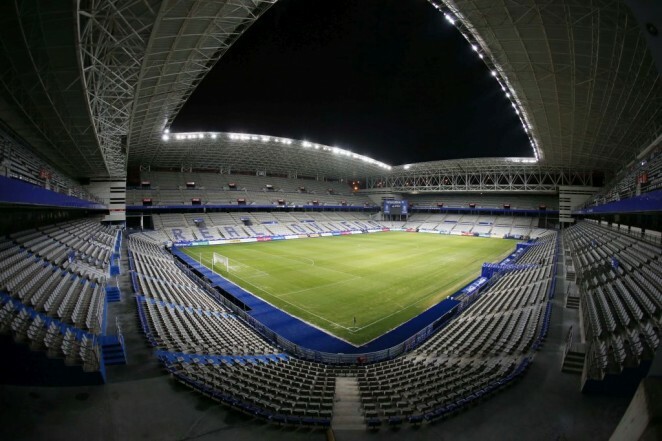 On 20th September 2000, the stadium was officially inaugurated with an encounter between Real Oviedo and Partizan Belgrade (Serbia), which saw the home side lose 2-0. However, there had already been an official match played at the stadium three days earlier, with Real Oviedo drawing 2-2 against U.D. Las Palmas in a First Division fixture. The first goal seen at the stadium was a penalty scored by Las Palmas player, Robert Jarni, while Losada scored the first Real Oviedo goal at the stadium.